I’m a fan of ‘case study’ type research and analysis, so I think I hit pay-dirt when I found this book. I’ve had the book on my shelf for a couple of years now and keep coming back to it and re-reading whenever I’m looking for inspiration (or just a good read). The basis of the book is explained in part two of the book, basically methods and techniques for the ‘good guys’ to fight back against the ‘bad guys’. The line is far too blurred and ambiguous in these cases for me to recommend anyone trying these techniques in the real world, at least not without a very good understanding of all of the relevant laws. In real-world examples so far I’ve seen researches err on the side of caution and not fight back. A real world example and debate of the possibility can be read with Tipping Point’s blogs regarding the research of Kraken, article in question can be found here although I’d recommend reading all of their posts regarding the Kraken research as it is still interesting, even after nearly twelve months. In the first part of the book each chapter (8 in part one) focuses on a different topic and scenario, and is written by a different author (including Johnny Long and Dan Kaminsky, with all authors being recognisable from their own fields). 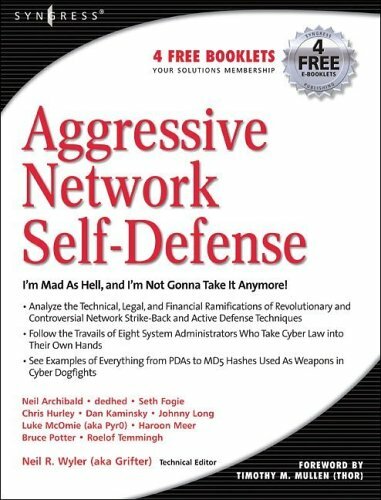 Topics range from modifying network games to trap and identify a system intruder, to a blow by blow account of an intruder and sys admin fighting to gain/maintain control of the corporate net.